Almost from the start, and even pre-dating them (ca. 1533), the French Psalters also contained some extra texts: liturgical or for personal devotion. Once more it was Clément Marot who wrote them (or under whose name they were published). Below a survey of 'how they came into being' and (dis-)appeared in (from) the Reformed Humnbooks. A similar summary, but with scholarly references, can be read on a similar page at www.clementmarot.com. At the end of this page: some handy tables. The illustration you see is a very special one: it is the 'table of contents' of the Hymnbook of Lyon, dated 1549. Next to the 50 Psalmes, the 'extra texts' are summed up. Amazing: the 'Angelic Greeting' (protestanticized Ave Maria) is present as well, and with melody. It was sung. [The 1548 edition of Lyon is the same, apart from this one hymn]. This is in my opinion the closest we get to Calvin's 1543 hymnbook (of which no copy survived). In 1533 (the ‘Evangelical Wonder Year of France’ with the King’s Sister Marguerite in charge in Paris and the Lenten sermons of Gérard Roussel in the Louvre) Clément Marot started to supply the Evangelical movement with some basic religious texts in the vernacular. The first specimen appeared in a Lyonnese reprint of the first collection Marot’s poetical Works (L’Adolescence clementine), which had appeared in Paris in 1532. Juste – unauthorised – published this hugely successful book in 23 February 1533 and added some material: a verse translation of the Lord’s Prayer and the Creed (in two parts), introduced by the publisher as Le Pater noster, et le Credo en francoys faict et traduict par ledict. C.M. et offert na guyeres a la Royne de Navarre.As mentioned : this edition was not ‘officially’ supervised by Marot. 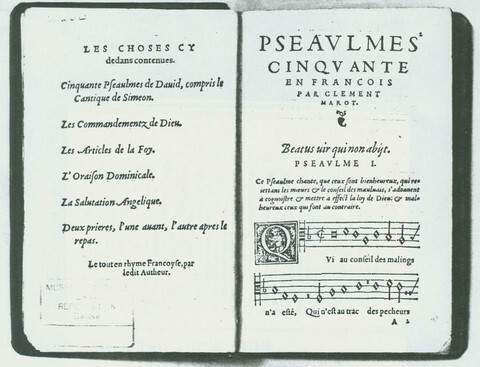 To these two fundamental texts Juste added a Benediction devant manger (“Nostre bon Pere tout puissant”) in a reissue at 12 July 1533, the ensemble now being introduced as Foy d’ung chrestien. About the same time the same prayers (Creed, Lord’s Prayers, Benediction) appeared in print as the last part of a curious amalgam of Evangelical epistles dealing with prayer, published in Paris by Antoine Augereau: The title of the prayer section in this publication is L’Instruction et Foy d’ung Chrestien. Still in 1533 the same printer, Antoine Augereau, (re-)issued Marguerite’s devotional book: Miroir de l’ame pecheresse three times. At the end of another tract (orthography) appear two new prayers in the Instruction: a French translation of the ‘Ave Maria‘, the Angelic Salutation (“Esjouys toy Vierge Marie” -- In this 'purified' version of the Ave Maria, the two biblical elements of the Ave (The Angel's Greeting and the Blessing by Cousin Elisabeth) are retained. The second part of the Ave (invocation: ora pro nobis) is suppressed) and a Graces pour ung enfant; a postprandial prayer (“Nous te remercions nostre Pere celeste”). Enlarged with Psalm 6, the Instruction et Foy (1533) was integrated in the second edition of La Suite de l 'Adolescence clementine, even figuring prominently at its beginning (Paris, Veuve P. Roffet, 1534; Mayer n° 17). It gets a title of its own: Instruction Chrestienne. The versification of Psalm 6 is added to this section. Since it is not sure whether Marot really authorized this edition, there is no conclusive evidence of Marot's authorship. All poems however, but one, the Benediction devant manger (“Nostre bon Pere tout puissant”) are incorporated in Les Oraisons, the section that concludes the 1538 edition of Marot’s Oeuvres (Lyon, Dolet/Grypius; Mayer n° 70/71). This authenticates all texts/prayers, except the Benediction devant manger. In the Paris edition of Marot's Psalm poem (1543, Roffet, Paris) the last of the Psalm poems is not a Psalm, but a song: the Canticle of Simeon (Or, laisses, Createur). In a seperate part we find the Lord’s Prayer, the Creed and the Angelic Salutation (with only slight changes in the text). The prandial prayers in this edition are new and replace the predecessors of L’Instruction (and La Suite): Before dinner: O Souverain Pasteur et Maistre and the Grae after the meal : Pere eternel, qui nous ordonne.. The Geneva text edition (1543, Girard) includes alos the Ten Commandments: Lève le coeur. From then on these extra’s become part and parcel of the hymnbook (or book of common prayer) of the Reforming Churches, issu de Calvin. First often with melodies, but gradually only as texts for private devotion. The Ten Commandments and the Canticle of Simeon became part of the liturgical order, so they kept their tunes. Below a schematic overview. · AC-Juste2 = Edition of Adolescence Clementine by Juste of 12/07/1533 = Mayer 14b: A title is added: Le foy d’ung chrestien. · Oeuvres38 = Les Oeuvres de Clement Marot 1538 (Dolet/Gryphius) = Mayer 70/71 : the title of the section : Oraisons. Apart from the Canticle of Simeon and the Decalogue, melodies are not always present and not always the same. For precise info: consult Pidoux, Psautier Huguenot I (melody nrs: 201-207). From 1562 the Geneva editions still keep the Creed, the Lord’s Prayer, and the two prandial prayers, but without melodies. · GE62 = Cent Cinquante Pseaumes.. many editions, which differ sometimes with regard to the inclusion of the ‘extras’.